Convincing someone that your business idea is worth the investment isn’t always easy but two Grade 6 classes at Riverside Education Centre were up to the challenge, and on November 25th, there was a new twist on persuasive writing. 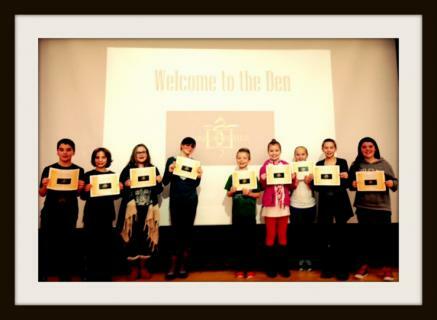 Nine students entered “the den” and pitched their ideas to "The Dragons” as well as an audience of their peers. The host, Mrs. Currie, introduced and encouraged each of their ideas. The students passionately shared their creations and displayed excellent communication skills. They were excited and prepared for their time in “the den”. They answered questions from the judges with honesty and grace. Each student displayed REC student qualities of Respect, Effort and Citizenship. An honorable mention was given to Eytan for his carbon car and all of the great environmental work he is planning. However, the Dragons put their backing into Mitchell's creation, a jiffy stick, that will change camping experiences forever (especially if you love popcorn). His creation was easy to produce, cost effective and he already had a solid business plan. All of the students deserve to be honored and commended for a job very well done!